In early July 1875, a building committee consisting of William B. Stevens, Albert Bailey and Jonathon Johnson contracted with E.R. Aldrich, Esq. and Mr. George W. Farr to erect a building from a design of Mr. Farr. The keys to the new edifice were handed to the Building Committee on May 1, 1876. The cost, including the site and the furnishings was about $15, 000. 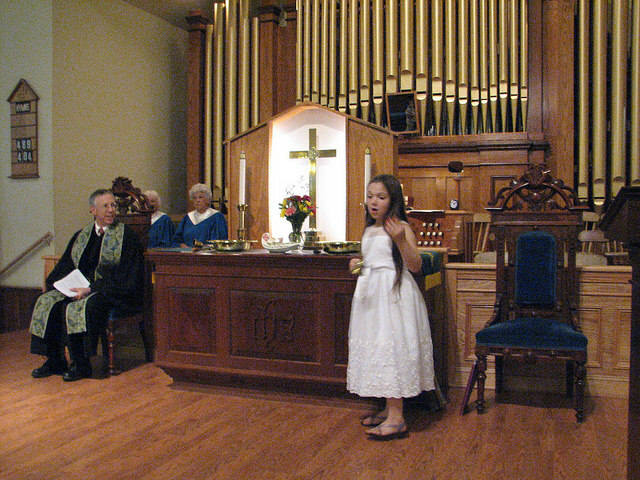 There was a special dedication service on the morning of July 6, 1876, conducted by Rev. Lester H. Elliott, with the sermon by the President of the University of Vermont, Rev. M.H. Buckham, and a long dedicatory prayer by Rev. Silas McKeen. In the evening there was another special service. This new church building replaced the old building which was moved to the back of the property that now houses The Old Church Theater. On June 19, 1877, a pipe organ, costing with all fixtures about $1500, was played for the first time in public. The bellows needed to be pumped by hand. 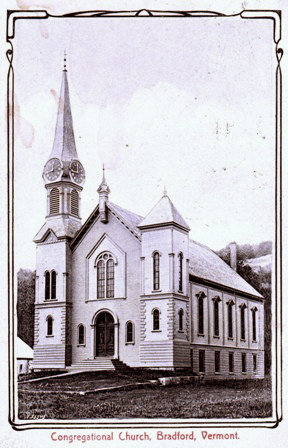 Between 1894 and 1899, electricity was installed in the church, and in 1910 an electric motor and blower were installed on the organ to replace the bellows. Between 1949-1957 extensive renovations were done to the church. 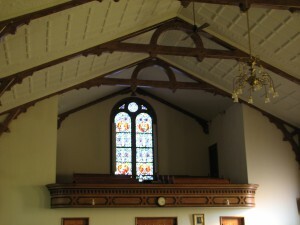 An automatic, steam, oil-fired furnace was installed, the ceiling of the sanctuary was insulated, new wiring was installed, two small classroom were built under the front stairs, the kitchen we rebuilt in what had been the woodshed, restrooms and a rear stairway to the sanctuary were built. The Pastor’s Study was renovated. $15, 000 was borrowed to do this renovation project; in one year $14,000 was repaid, at the annual meeting in 1955, the mortgage was burned, and in 1957 the final $1000, a grant from the Vermont Conference, was paid off. Our very first Wild Game Supper was held in 1958 and $121 was raised for a sidewalk leading from the vestry to Main Street. The suppers have grown over the years, netting the church profits around $10,000 each year for the past several years – this profit is designated to only be used for major repairs to the church building. In 2015, we will hold our 60th supper. The balcony overlooking the sanctuary, seats about 100. 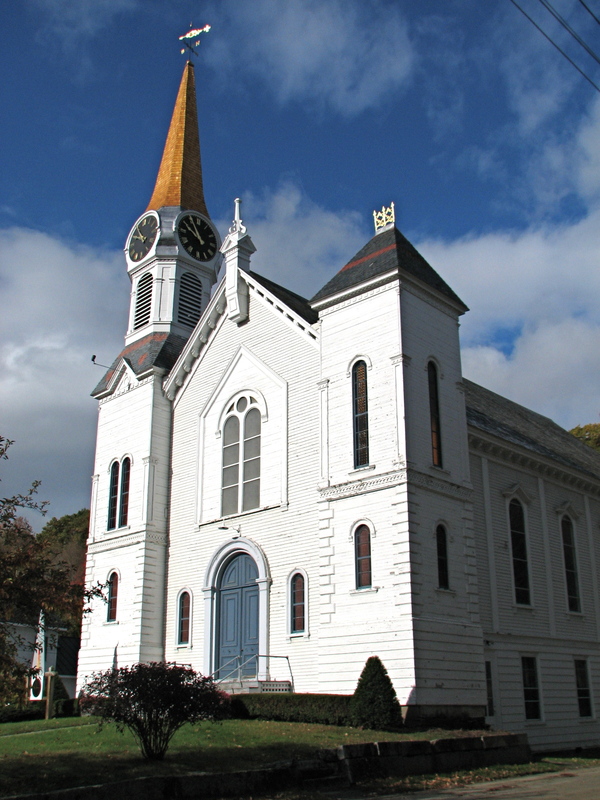 In 1979-1980 the sanctuary was completely renovated and was re-dedicated in a special service on May 18, 1980 by Rev. John B. Knight. Between 1984-1986 a renovation of the ground floor of the church was completed. The altar and organ area. Major changes included creating six Sunday school classrooms and a nursery-conference room, each separated by dividers. Kitchen, bathrooms, and storage areas were also modified. A cabinet for the china set was installed. The outside door was made accessible for wheelchairs. The exterior of the church was re-painted and the grounds landscaped. And in 1987, an elevator was installed and dedicated on November 22nd. Our church after the steeple and clock renovations. And just recently, in the summer of 2015, a major renovation of our church’s steeple and the town clock was completed. 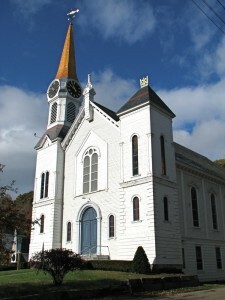 Funds for these renovations come from Act’n Spire, a community improvement project jointly sponsored by Bradford Congregational Church and Old Church Theater, whose goal is to improve and preserve our respective facilities, which provide services, education and arts to the greater Bradford, Vermont area. 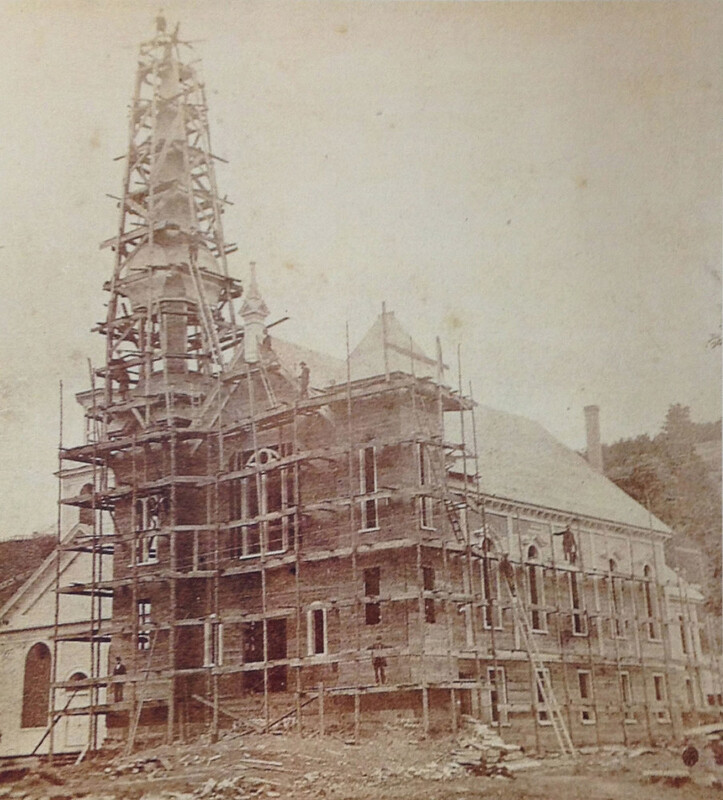 Act ‘n Spire is currently raising funds to restore the town clock (and the church steeple in which it is located) and to make structural and exterior improvements to the theater building. To learn more about Act ‘n Spire, or to make a tax-deductible donation, please visit www.actnspire.org.